The Dobson has many advantages. The price of a Dobson is usually reasonable and it does not weigh as much as other telescopes of the same size. The Dobson telescope is very easy to transport and set up. It is also easier to operate than most telescopes and it has a compact mounting system. 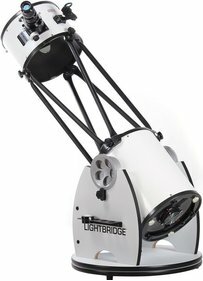 The telescope is ideal for observing deep-sky objects under a dark sky. Despite its size it is relatively easy to take this telescope with you to a remote spot without city lights. Many hobby astronomers prefer a Dobson telescope. This telescope will often be a Newton telescope and it is mounted with widely available materials. Most Dobsonian telescopes are big but they still fit in your trunk. Its mirror obviously weighs less than thicker mirrors so it is able to handle a much bigger diameter. The Dobson telescope has an alt-azimuth mount so single-arm secondary mirror support will suffice. Disadvantages of a Dobson telescope? 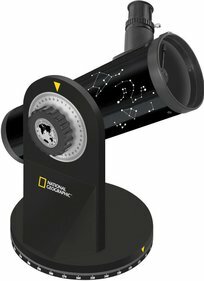 Does the Dobson telescope have any disadvantages? 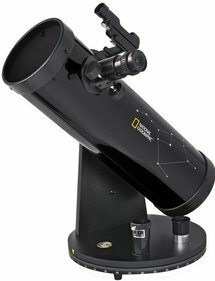 As the Dobson telescope is not motor-driven and the celestial bodies cannot easily be found, this telescope is not suitable for astrophotography. As a result, you will have to keep tracking the stars yourself. Because of the rotation of the earth you will have to readjust your telescope already after several minutes. In addition, the telescope may start experiencing balance problems when you hang accessories on it. You can easily solve this problem, however, by hanging a counterweight on the telescope. Yet most Dobsons can deal with a small degree of imbalance. For a telescope with alt-azimuth mount it is difficult to find objects that are right above you (zenith). Improvements in the material carrying the alt-azimuth mount and the design may diminish these problems but they cannot completely eliminate them. Despite these disadvantages a Dobson telescope is a very good choice when you are a hobby astronomer and prefer a relatively cheap telescope that is easy to transport and set up.